Two-dimensional printing (in an efficient way, that is) dates back to Gutenberg. It revolutionized how people were able to disseminate information and began the slow process of democratizing knowledge (or at least making books cheaper, ergo easier for more people to access). Fast forward to today and 3D printing is trying to do something similar. Technically, 3D printing is over 30 years old, but it is only in the past few years that it has entered the mainstream. In theory, the process is very similar to a computer inkjet printer. Once the 3D design is fed into the machine, a combination of heat and material are injected into the correct place, slowly building up the object layer by layer. As the technology has improved, so the variety of materials has increased. Initially, only plastic could be printed. But now, it is possible to print metal, stone, even human tissue. A long time ago, I used to wish that model railroaders could invent some sort of “shrink-anator” to make an HO scale copy of any object. When I first heard about 3D printing, probably a decade ago, I was excited about what the technology might mean for model railroading. 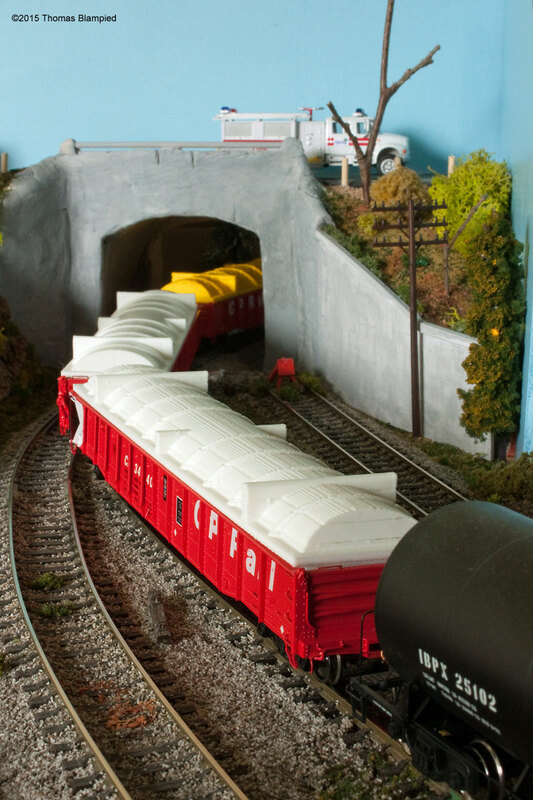 Until now, if you wanted an HO scale object, you had two options: you could buy a ready-made version or a kit; or you could build it from scratch. This was fine, provided a manufacturer made what you wanted, or you had the required skills to make one yourself. Today, 3D printers offer a third option: become your own manufacturer. Traditional plastic models were made by injecting a polystyrene plastic into moulds. This required moulds and the skills to make them. The process is long and expensive, but the level of detail is remarkable. Most model trains are still made this way. However, with 3D printing, most of the complex and costly mould process is eliminated. Provided you have a 3D design, simply feed it into a 3D printer and watch as your object is printed before your eyes. It is truly remarkable. Unfortunately, even the most basic 3D printers are still hundreds - or thousands - of dollars and not worth it for the average person. Many companies, such as Shapeways [http://www.shapeways.com], offer to print objects from user-created files, but these can still be quite expensive. In their great tradition of allowing the greatest number of people free access to knowledge, public libraries have gotten in on the act too. I had recently received a set of Rapido Trains gondola cars. Given that I model northern Ontario, where the main freight is mining or forestry-related, I thought a set of covers for the gondolas would look nice, even if it did mean hiding some of Rapido’s trademark interior detail. Gondola covers are made by a variety of manufacturers, notably Models by Dave [http://www.modelsbydave.com], but to cover my fleet would have cost over $50. The design seemed straightforward enough, so I decided to try designing one myself using prototype photos as a guide. As 3D printing has become mainstream, so the number of software applications to design 3D models has also grown. 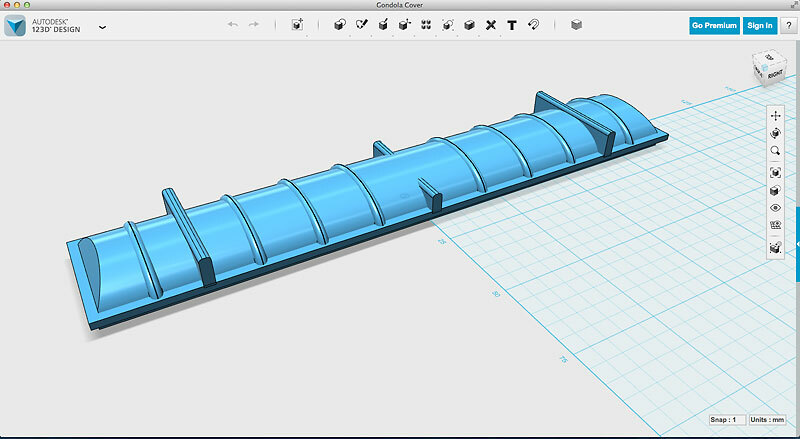 I opted for the free 123D Design [http://www.123dapp.com/design] from AutoDesk (of AutoCAD fame). It’s BIG - the Mac version is over 700 MB - but surprisingly fast and powerful for a free application. * Learning to use 3D design software is a little confusing: you need to build in order to cut away sections, but I soon got the hang of the basics thanks to AutoDesk’s helpful videos. [https://www.youtube.com/user/123d/videos] My design wasn’t exactly to scale, but it looked good. Now I needed to print it. Screen capture of the finished design, ready for printing. First, I tried Shapeways, but their quoted price was over $20 USD per cover based on their most basic plastic material. I have no doubt that the quality would have been good, but it would have cost more than the commercially-available covers. However, I had a trick up my sleeve. Recently, my local library acquired a MakerBot Replicator 2 [https://store.makerbot.com/replicator2.html] printer so that patrons could use it to print their own objects. Even better, thanks to a grant, the service was (and still is at the time of writing) free of charge. All I had to do was send in my file, and wait for my turn in the queue. The MakerBot Replicator 2 uses PLA plastic, which is derived from corn. It is heated, melted and injected layer-by-layer to build up the shape. Even better, because it is corn-based, the melted plastic smells like chocolate sweetness, rather than burning rubber. I sent in my design and waited. Apparently, my design took about 2 1/2 hours to print. A few days later, I was able to collect the finished product. The first gondola cover, fresh from the printer. As you can see, the printer builds its own scaffolding-like framework to support the object during construction. This frame is designed to be easily broken away by hand, but a knife and sandpaper help. A rotary tool with a sanding attachment works even better than sandpaper, but will eat through the plastic quickly - beware! Except for the fanciest 3D printers, the grain of each layer of injected plastic is clearly visible (like the rings of a tree). For now, injection-moulded plastic still has the edge, but 3D printing will certainly win out one day, especially for rapid-prototyping or one-off designs. The technology eliminates the need for moulds altogether. In all, I ordered four covers, which I collected over a period of about three weeks. Although not as quick as getting them printed professionally, I couldn’t argue with the price. In terms of quality, however, there was a price to pay. Two of the cover are slightly warped, one appears to be missing a layer of plastic (making a “stepped” appearance) and one was, confusingly, printed upside-down, meaning that all the framework was moulded onto the curved surface, which required additional sanding and filling to fix. However, once the covers are seen as part of a freight train, the blemishes soon fade and look really impressive on a fleet of really impressive gondolas. In the end, I was willing to compromise in order to take advantage of the library’s offer and most of the errors can be corrected, or ignored. A string of gondolas enters Foulard Yard on my proto-freelance ONR Green Bank Sub. Prototypically, most gondola covers are a slightly off-white colour. Since I could have the covers printed in white plastic, the finish was already complete. For the one printed upside-down, I disguised the worst of the damage under several coats of yellow acrylic paint. This also adds variety to the model. 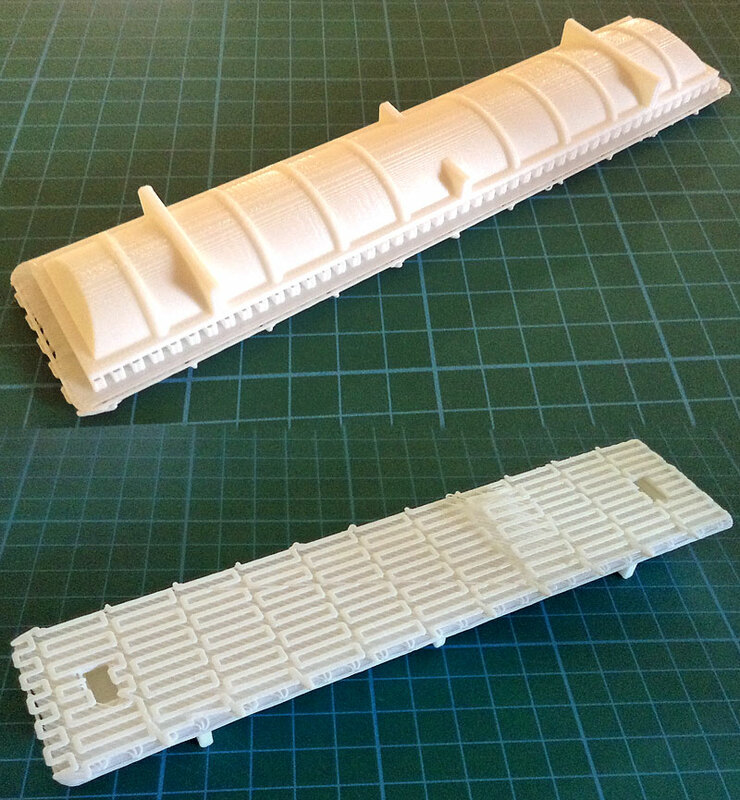 Since the success of the covers, I have designed and printed a winterization hatch for my Ontario Northland GP38-2 and am in the process of designing a set of ramps ramps for the ends of a TOFC flat car. As for future projects, I am currently out of ideas, but the next time I want to make something for my layout, I will look beyond manufactured parts and scratch-building and consider what the digital age offers me: the chance to be my own manufacturer by designing and printing my own models. *The free version of 123D is for non-commercial use only, so you can’t sell your designs.